Minneapolis, the larger of the Twin Cities, does everything on a grand scale. The city says it has more theater seats per capita than any city outside New York; its skyline include the 1929 Foshay Tower, the first skyscraper built west of the Mississippi; and its miles of trails trace the second-longest river in America—the Mississippi. But you can still find the city’s Scandinavian roots in areas like the North Loop. 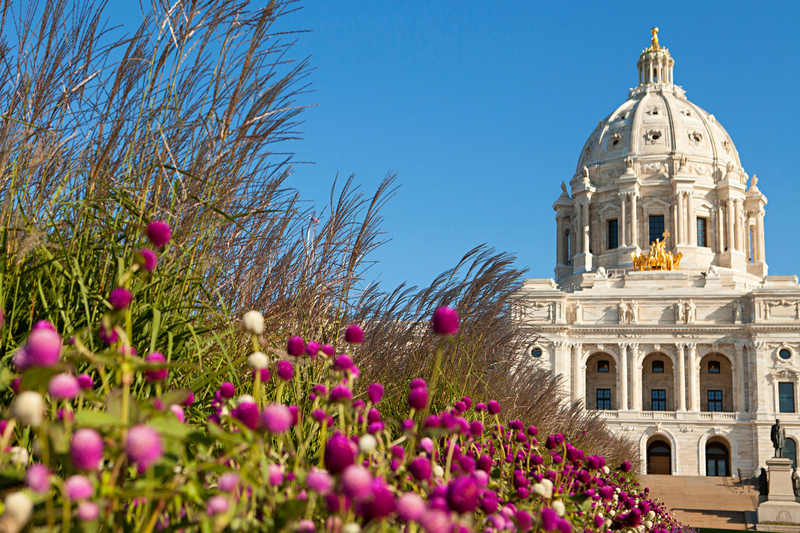 Saint Paul, the state capital, charms visitors with the 1905 capitol topped by four golden horses and with Victorian-era architecture in neighborhoods where Irish, French and German Catholic roots run deep. Explore the Loop @ 3 p.m. The North Loop is in the midst of a renaissance. Once an industrial rail yard dominated by warehouses, it’s now the fastest-growing neighborhood in Minneapolis with more than 4,300 residents living in a seven-square block area adjacent to downtown. The entire North Loop neighborhood is listed on the National Register of Historic Places, so despite rapid development, it’s maintained a lot of original charm. Shop the locally owned boutiques for a peek inside some of the most beautifully restored spaces. Check into the Hewing Hotel @ 5 p.m.
Once a former farm implement warehouse, the Hewing is now a stylish boutique hotel in the heart of the North Loop. Each of the Hewing Hotel's 124 rooms features the structure’s original exposed timber and brick stylized with custom furnishings and local touches, such as Faribault Woolen Mill's Cabin Blankets. 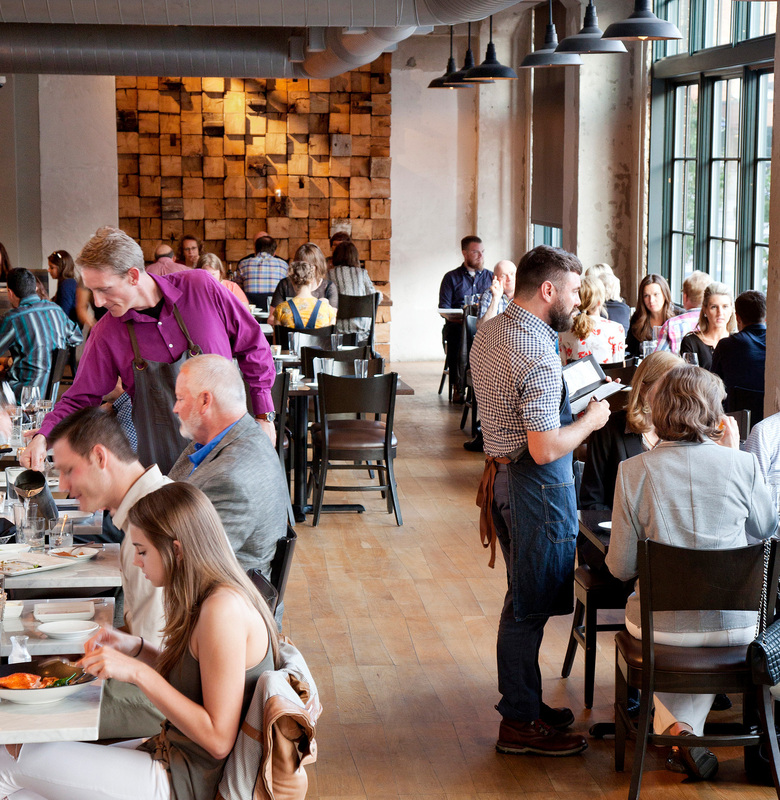 Within walking distance of the Target Field light-rail station, the Guthrie Theater and a variety of dining and nightlife options, the Hewing makes a convenient home base for the weekend’s urban explorations. Hyper-local happy hour @ 6 p.m.
For a great craft cocktail, simply head downstairs to Tullibee, the Hewing Hotel’s restaurant and bar. Tullibee aims to perfect the art of traditional Scandinavian cooking, featuring seasonal ingredients sourced from local vendors. This philosophy carries through to the inventive craft cocktails served up mixologists who do not take their job lightly. Try the Spruce Soda Co. Sage Tonic featuring locally distilled Tattersal gin. The new burger king @7 p.m.
An ever-evolving crop of innovative and award-winning restaurants are mere steps from the Hewing's front door. Snag a seat on Borough's elevated patio when the weather is good or inside the garden-level Parlour Bar when it's not. Either way, order the Parlour Burger made with a savory blend of ground sirloin, ribeye and brisket formed into two thin patties and topped with American cheese. Round it out with a side order of crispy hand-cut fries and a signature cocktail, like the Bramble made with Edinburgh Navy Strength Gin, Crème de Mure and lemon. Friday night lights @ 9 p.m.
Drive 1.5 miles east on Washington Avenue to Gold Medal Park, a 7.5-acre green space next to the Guthrie Theater and the Mississippi River. The park features public art transplanted from the Minneapolis Sculpture Garden and mature trees shipped in from places as far away as New Jersey. But the main attraction is the glowing 32-foot mound that appears to have been designed by Dr. Seuss. Walk its illuminated spiral path to the top for a view of the Stone Arch Bridge spanning the river and the neon signs of historic St. Anthony Main Street on the opposite bank. Afterwards, head down the boardwalk toward Mill Ruins Park. In its 19th-century heyday, this area put Minneapolis on the map as the world’s leading flour producer. What remains today are beautifully illuminated mill and canal ruins that are safe and fun to explore at night. Cap off the evening with a walk across the Stone Arch Bridge. Remember to turn around at the halfway point for a breathtaking view of downtown. Fresh and friendly breakfast @ 9 a.m.
Moose & Sadie's has become a North Loop mainstay for serving food that is fresh, inventive, organic and most importantly, unpretentious. Check out their chalkboard menu for the day's “Special,” which typically features a colorful assortment of ingredients and flavors influenced from the far reaches of the globe. Dip a freshly baked scone into a mug of fair trade coffee, and breakfast is served. Roll like a local @ 11 a.m.
Every day, roughly 4,500 bike commuters travel along the more than 226 miles of on-street bike lanes, bike boulevards and dedicated paths in Minneapolis. Explore the city like a local by renting a lime green Nice Ride bike from one of the more than 200 stations located throughout Minneapolis and Saint Paul. Download the app to locate the nearest bike rack and follow one of their designated tour routes. The “Art Al Fresco” tour highlights famous pieces of public art located throughout downtown and culminates at the Walker Sculpture Garden. Sculpture Garden and lunch at Esker Grove @ 1 p.m. 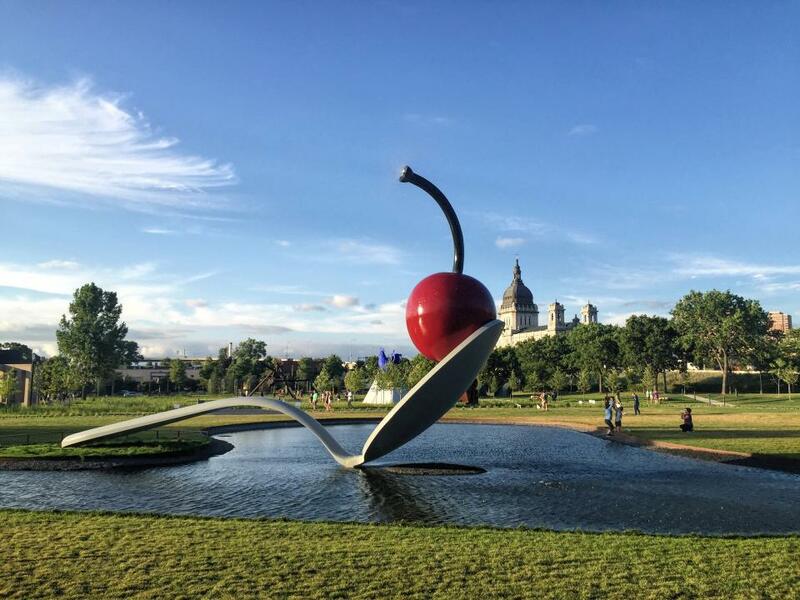 The Minneapolis Sculpture Garden, a collaboration between the Walker Art Center and the Minneapolis Park & Recreation Board, recently underwent a two-year, $33 million makeover, transforming the country's largest urban sculpture garden into one of the city's hottest attractions. The 11-acre property features more than 40 works of art, including an artist-designed mini-golf course. Admission is free. Minneapolis Sculpture Garden. Photo by Robin Pfeifer. After touring the Garden, head across the street for lunch at Esker Grove inside the Walker Art Center. Chef Doug Flicker created a menu of lighter, vegetable-focused dishes served from 11 a.m. to 3 p.m. daily. Try the grilled cheese made with raclette and apple on brioche and a petite green salad. End on a sweet note with a slice of almond cake topped with lemon, chèvre and thyme. Tour the Walker @ 3 p.m. The Walker Art Center is one of the most celebrated modern art museums in the country. With multiple galleries, a 385-seat theater, street-level and rooftop terraces, plazas, gardens and lounges, there’s plenty to ponder and explore. Don’t forget to pick up a souvenir in the Walker Shop before leaving. Dinner in Nordeast @ 7 p.m.
Just north of downtown is a vibrant neighborhood that is both old school “Nordeast” and new school “Northeast.” With a mix of residents, businesses and artists, the area has a vibe unlike anywhere else in Minneapolis. Dinner options are as numerous as they are nuanced. Most locals will recommend first-timers grab a spot in line at Nordeast’s favorite dive, The Anchor Fish and Chips. This small pub serves huge portions of fried Alaskan cod over a basketful of hand-cut potatoes. Round out the meal with a side of buttery Mushy Peas and a pint of Magners. Live dangerously @ 9 p.m. Thanks to the passing of the Surly Bill in 2011, Minnesota is experiencing a craft beer revolution with 120 breweries and counting. Few have gained the reputation of Dangerous Man for crafting interesting and innovative (and highly drinkable) pints. Locals love the Chocolate Milk Stout and welcoming taproom. Saintly brunch @ 9 A.M. In a tale of Twin Cities, Saint Paul is the statelier of the two. Nowhere is this more evident than the iconic Saint Paul Hotel, which offers children's etiquette classes and afternoon tea. 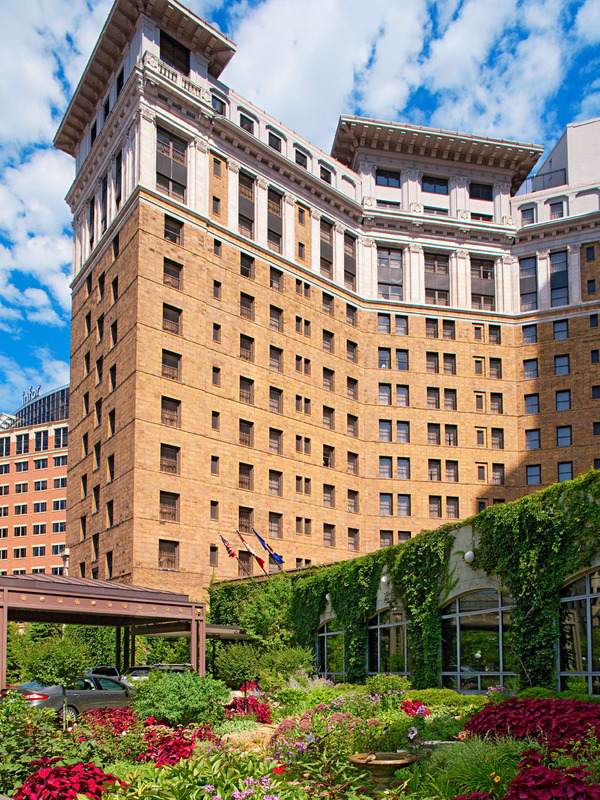 Consistently ranked among the country’s top hotels, the Saint Paul Hotel is known for its old-world charm and European-inspired elegance, and accommodates the most discerning brunchers. Infuse some grandeur into Sunday morning at the St. Paul Grill inside the hotel. A Colossal Carmel Roll appears on the table shortly after you’re seated. Once it’s devoured, order the wild mushroom and goat cheese omelet or the lemon ricotta pancakes. Napkin on the lap, please. Walk it off @ 11 A.M.
Named one of America’s “Great Streets,” Saint Paul’s Summit Avenue is a wide, tree-lined boulevard with a five-mile-long collection of pristine 19th century mansions, including the former residences of F. Scott Fitzgerald and James J. Hill. History junkies get to peek behind the curtains of these Gilded-Age mansions by taking the Summit Avenue Walking Tour conducted by the Minnesota Historical Society. Learn about the historic district’s architecture, original owners and social history (i.e.gossip). If the weather is not cooperating, stick to the Hill House tours. No visit to Saint Paul is complete without a stop at Cosetta Alimentari, a Saint Paul institution. Grab a slice in the 300-seat Eatery & Pizzeria on the ground level or head upstairs to Louis Ristorante & Bar for a family-style meal of pasta, secondi and dolci. Don’t forget to stop by the Pasticceria for a to-go box of pastries and delicacies for the journey home.